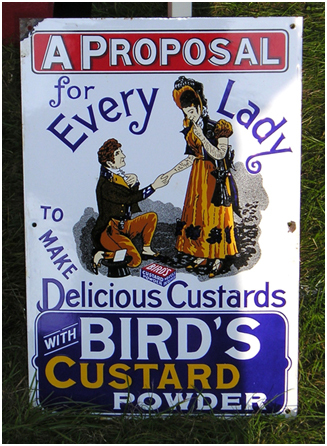 Enamel Art In Public Places – ADVOCATES FOR FINE ART ENAMELING INC.
Signs in the late 19th century and early 20thcentury used a lot of enamel. It was the best material for waterproof and fade proof colors located on signs on our streets. It allows easy removal of graffiti. It was a most visible medium in public places. There are new materials for signs now, so not much enamel is seen in public places. There are magnificent exceptions. I will describe some (very) large enamel art in public places. 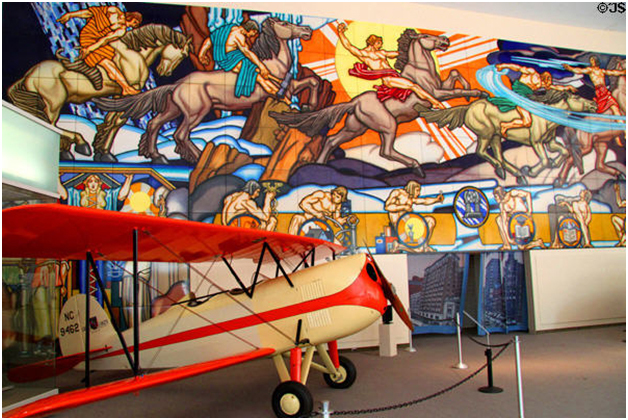 One giant mural, stylistically similar to Diego Rivera’s creations, was designed for and installed in, the New York World’s Fair of 1939. It has the heroic title: Man’s Conquest of the Elemental Forces of Nature. It is of equally heroic size. 28 feet high and 73 feet long. It was designed by J. Scott Williams, painted by Daniel Boza, and fired by the Cleveland Ferro Enamel company. Man’s Conquest of the Elemental Forces of Nature. Porcelain enamel mural. Western Reserve History Museum. Cleveland, OH. This mural is made up of steel panels. Enamel has been applied to the face of the panels. Steel panels are a popular choice for outdoor architectural enamels. They are strong, attach to walls easily and fit together nicely. They do not distort from the heat of firing the way that a large piece of copper would. The panels and the porcelain enamel seem to be the choice of painters who get commissions to do outdoor or public murals. They can apply opaque colors to a base of gray or white, much like a painting. For large pieces, colors can be sprayed on. Since the edges of these panels are turned down (flanged), the panels are always of some geometric shape. This is similar to the shape of the canvases and paper artist’s use. One artist who used such steel panels was Jacob Lawrence. Lawrence’s enamel murals used colors and a style similar to his paint and paper art. Space Time and Energy Mural. Jacob L:awrence. Orlando Airport. Copper can also be used for large enamels. 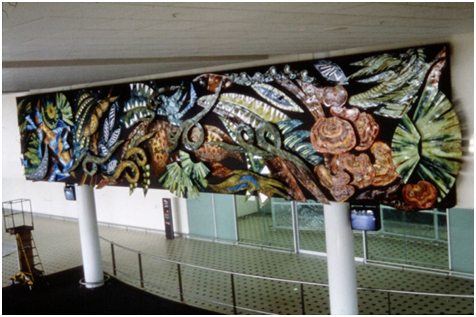 Debbi Sheezel of Australia got an invitation to do a mural at the Brisbane International Airport which would depict the flora and fauna of a local nature reserve. Debbi did a giant collage of separate copper pieces. She cut and enameled a copper section shaped like a leaf, for example, and attached it and other shaped copper pieces to a base. Placed together, the mural is 11 1/2 feet high and 55 feet long. It weighs tons! The mural is enormous, but Debbi’s experience making small enamel pieces and jewelry were the basis of her expertise with this large piece. 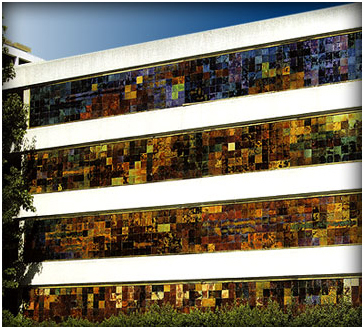 Fred Ball used copper squares to cover large areas of a building. Each copper piece showed a range of subtle enamel colors. Many of them were clear enamel over copper. This is the advantage of copper. The copper allows a wide variety of transparent colors, oxidation effects, textured copper underneath the enamel and a myriad of other effects which can’t be achieved with steel panels. Enamel has also been used in sculpture. It is an excellent medium for free standing outdoor art. One example is Stefan Knapp’s “Meeting Point” which is on the grounds of the Museum of Fine Art in Boston Massachusetts. This obelisk is 30 ft high. It was completed in 1996. 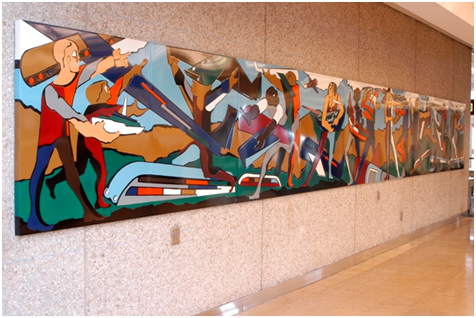 The examples of large enamel art in public places show a diversity of methods. There are various enamel techniques used. This article has been designed to present examples of the different ways in which glass on metal art can be applied to outdoor art. I am glad to be a visitor of this stark web site! , thanks for this rare info ! .